Juan began his musical studies at the school of the Musical Society Ruperto Chapi de Villena. He completed his studies of Middle Degree in the Professional Conservatory of Villena obtaining the “Mention of Honor” in the Extraordinary Prize of Degree and he recently completed his studies at the “Oscar Espla” Superior Conservatory of Music in Alicante in the specialty of trombone, obtaining honors. 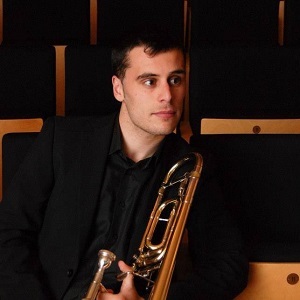 Juan is part of the Trombon Academy, also of the Madrid-Stomvi Academy and he is currently studying a master’s degree in performance at the Hochschule Für Musik in Freiburg (Germany) with Professor Fabrice Millischer. He was awarded, with the first prize, at many competitions: The XII National Contest of young interpreters “Jose Valcarcel” in A Estrada (Pontevedra), Young Interpreters “Ruperto Chapi” of Villena, Contest of young interpreters Antonio Serrano (Priego de Córdoba) and at the Concurso Permanente of JM Spain in 2015 in Bilbao. He is also expected to play in a tour in Spain and he will have his premiere as a soloist in the National Auditorium of music in Madrid. You can listen to Juan here. If you are interested in working with Juan, please get in touch with the EMCY Office.